I enjoy trips to Vegas. 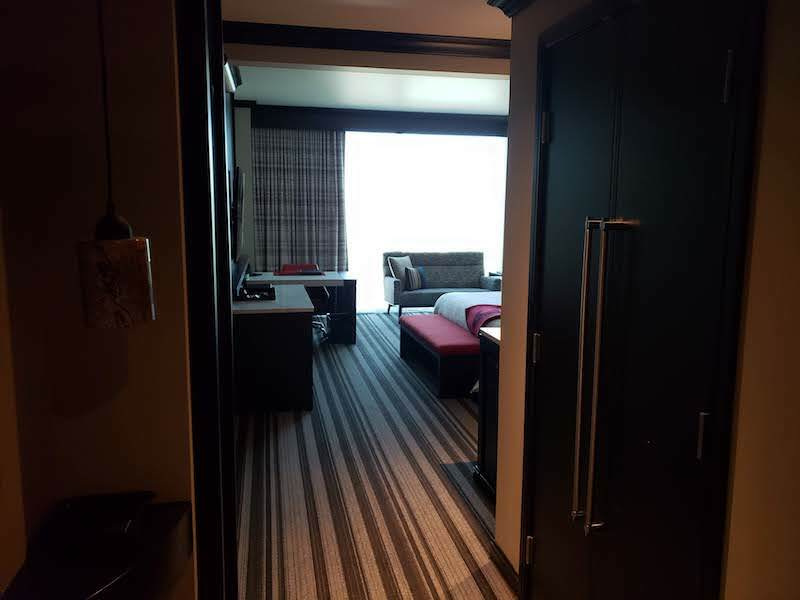 It’s sunny, a quick flight from Seattle, and you can typically get good deals on nice hotel rooms. 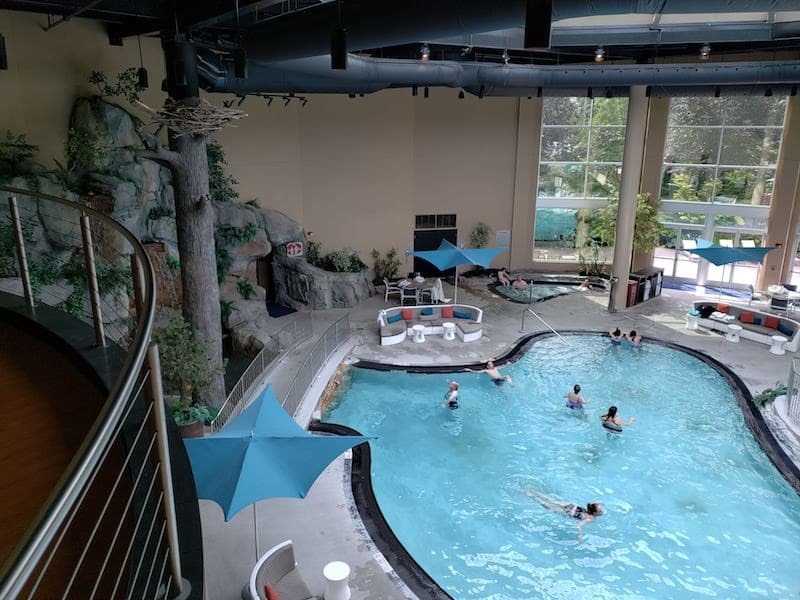 Recently I got an offer for a free weeknight stay at a local casino resort about 45 minutes north of Seattle. I decided to check it out. 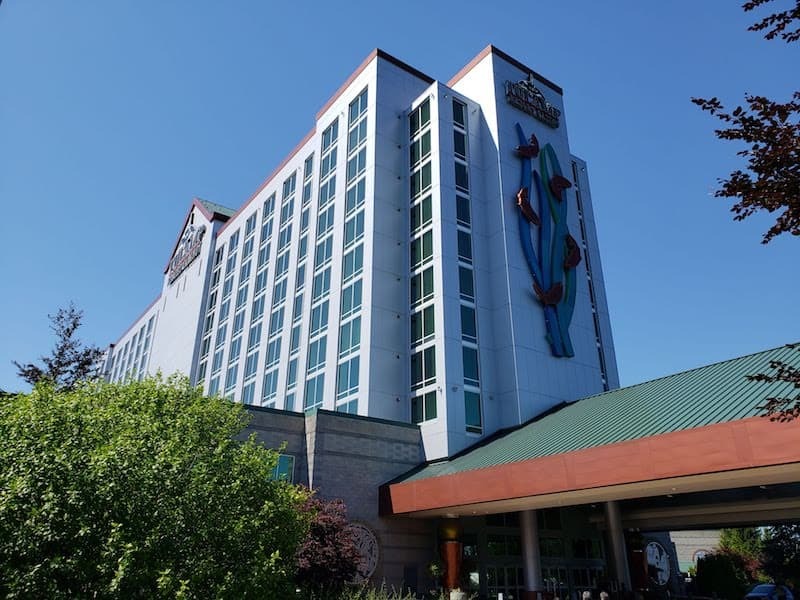 The Tulalip Resort Hotel opened 10 years ago in 2008. Since then, the rooms and guest floors have been refurbished and are fantastic. On par with the nicest of casino hotels in Vegas. 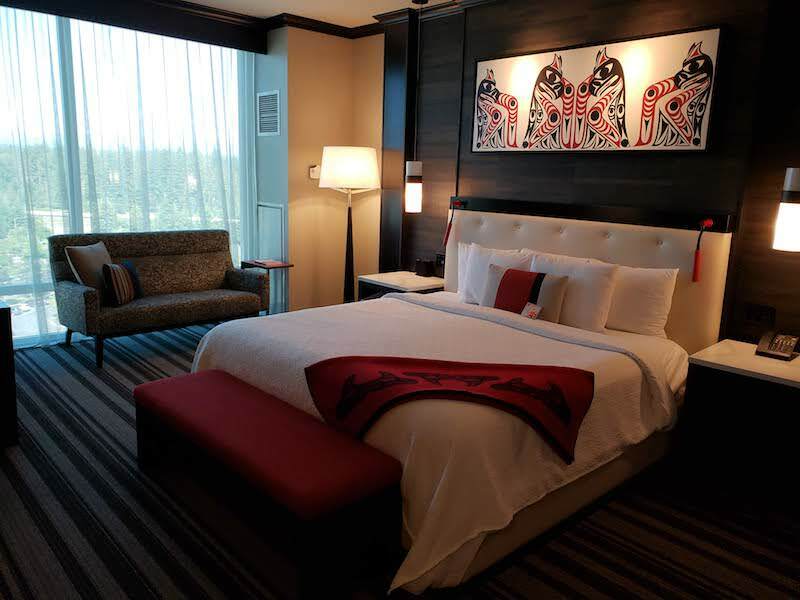 The Tulalip Resort is located on the Tulalip tribe reservation by Marysville, Washington. You can see the hotel tower from I-5. 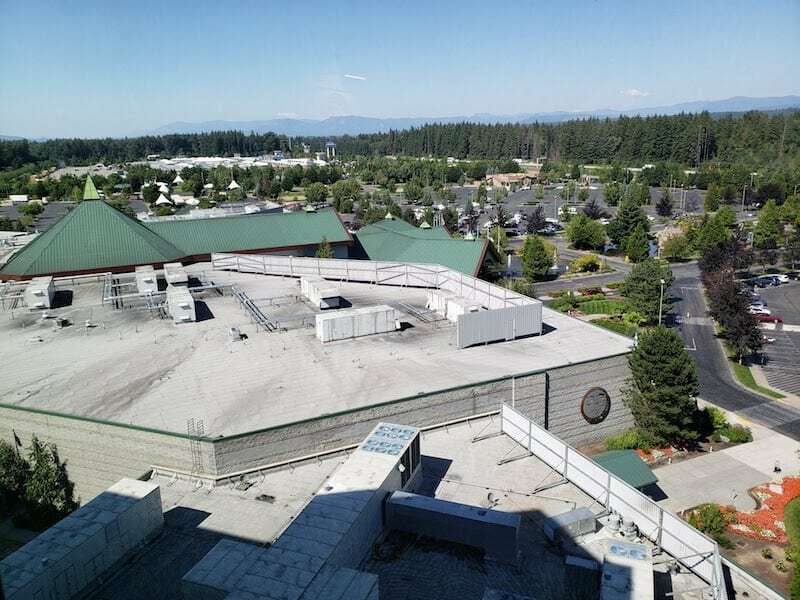 Connected to the hotel is the casino and across the parking lot is a large outlet mall. 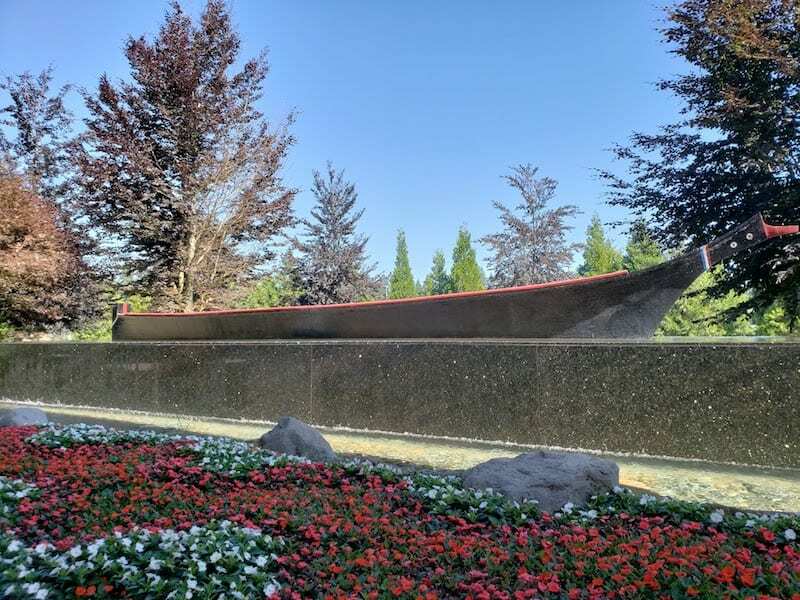 For those aviation junkies, it is only about 20 minutes from Paine Field and the Boeing Factory in Everett. 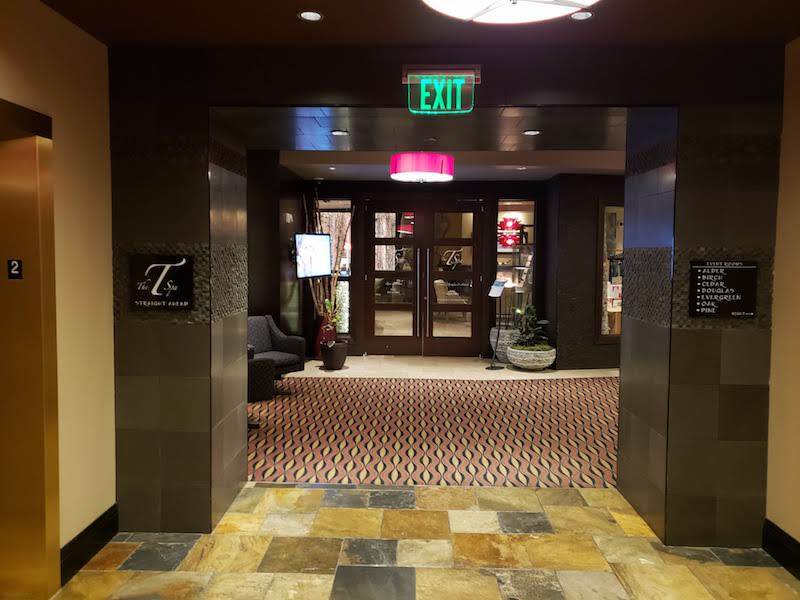 The hotel entrance is separate from the casino entrance. 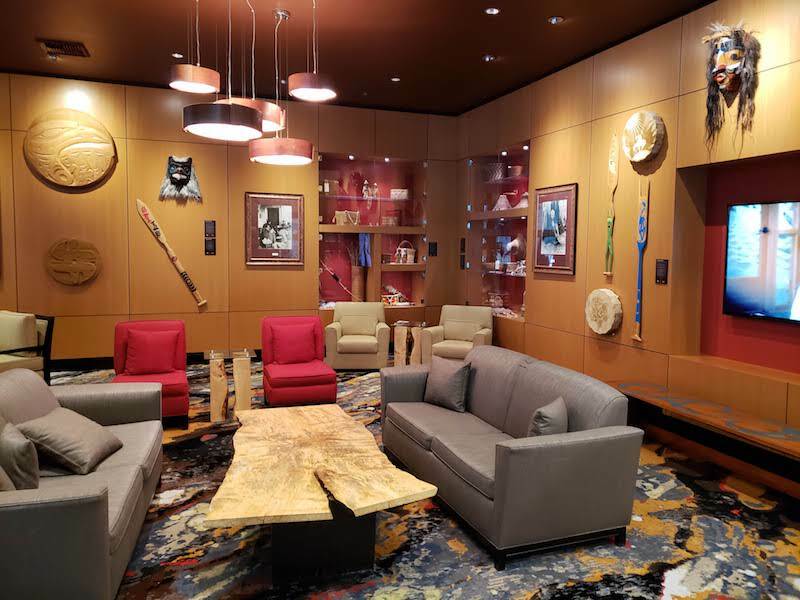 The lobby is dated (probably has not been touched since opening in 2008) but does feature some American Indian art. 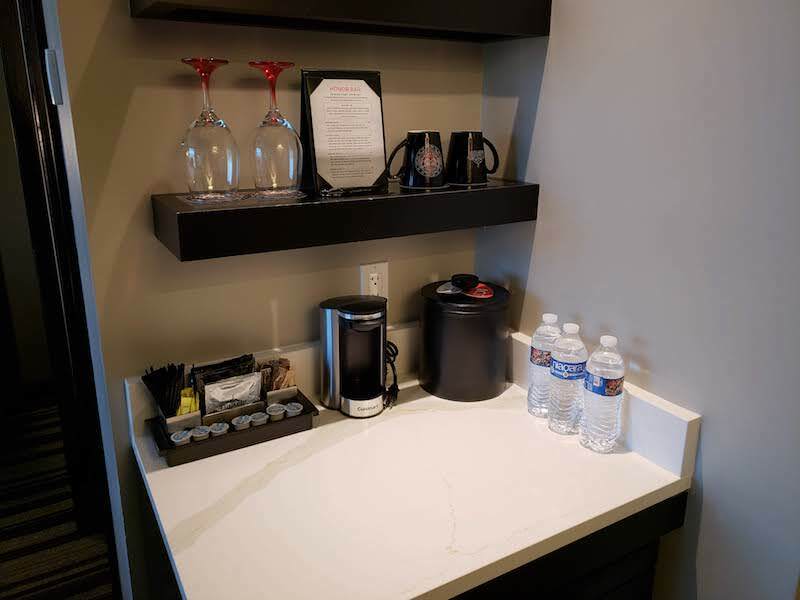 Check in was quick and I was told about the amenities. I was offered a room facing west (trees) or east (mountains and the highway) and I chose east to see the mountains. I was assigned room 1012. There are 12 floors total in the hotel tower. The elevators require a room key to access guest floors. 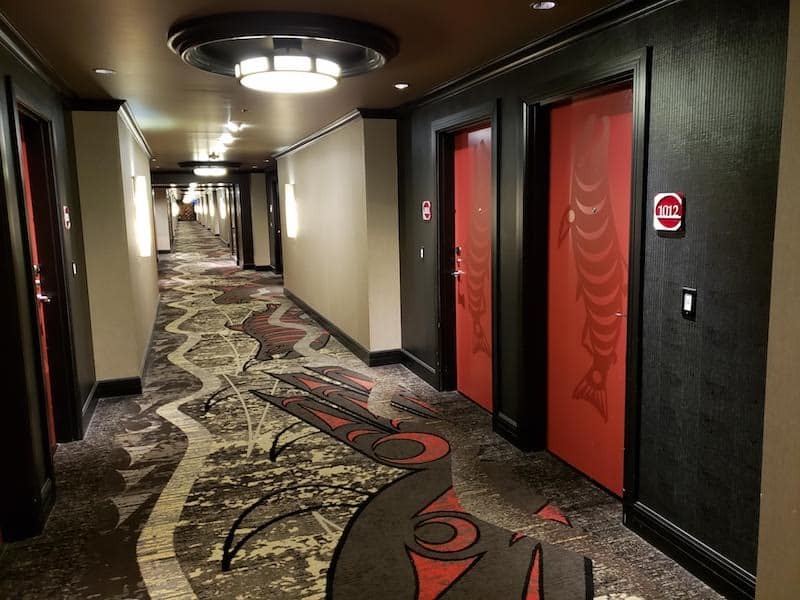 The guest floors themselves are dark and modern and incorporate native art. I had a standard King Bed room. The room is quite large. As you enter, there is a bit of a hall before you are in the bedroom area. All the furniture was in great condition. There are a lot of power and USB outlets throughout. Against one wall is the TV that had music playing upon entering the room. 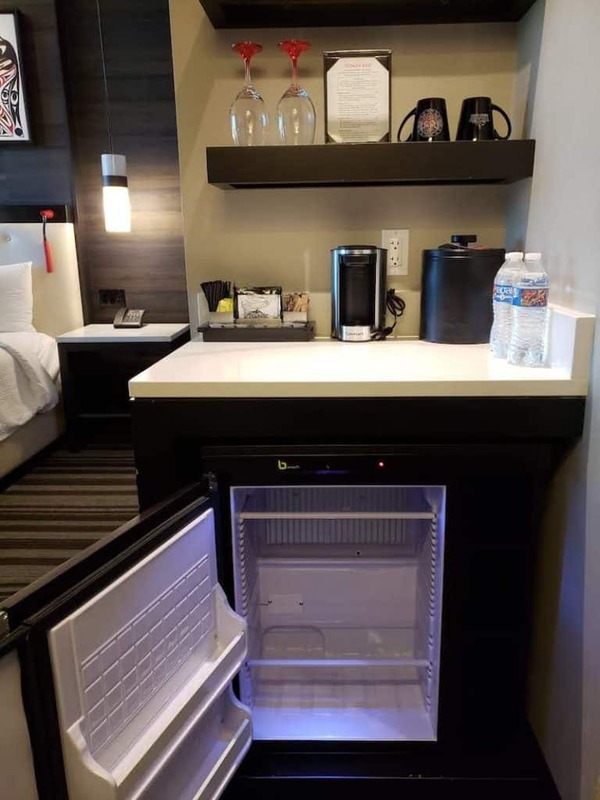 Beneath the TV is a dresser that has one of two mini fridges in the room. 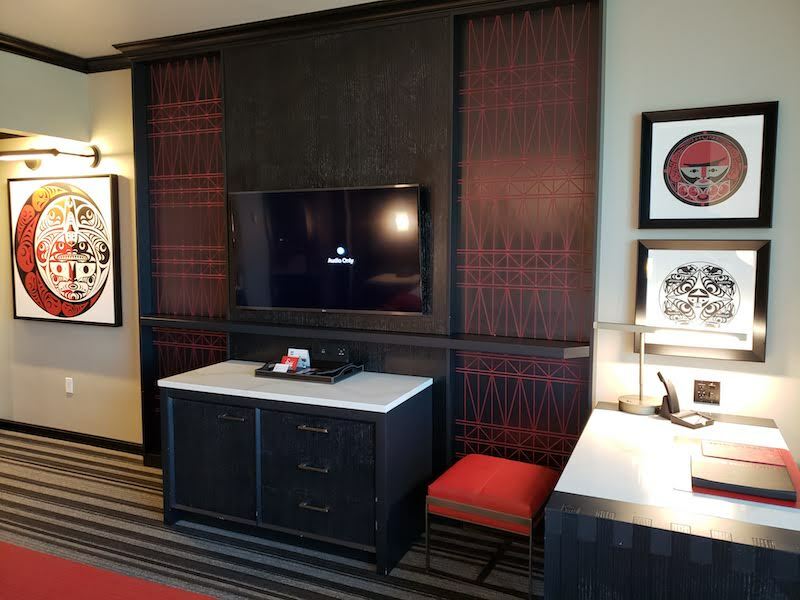 The desk is to the right of the TV. A small couch is against the windows that are floor to ceiling and let in plenty of light. The views are mediocre. 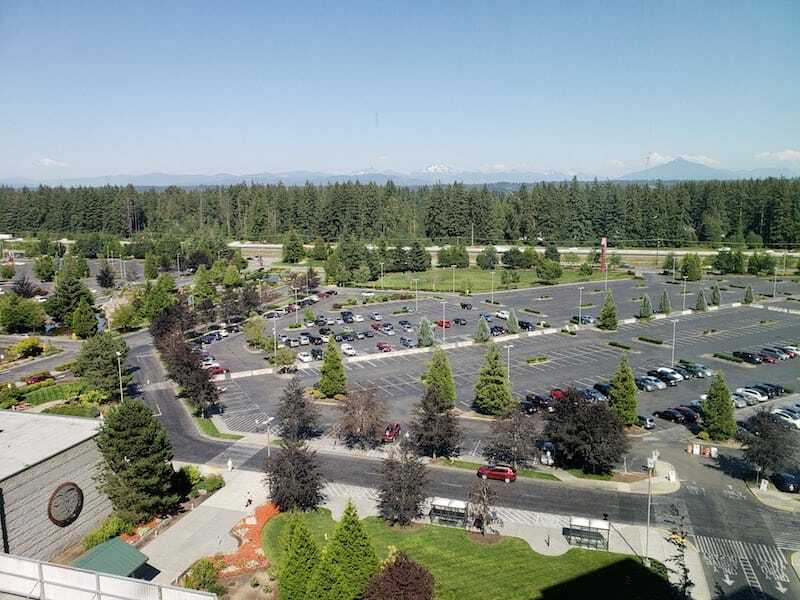 The resort is surrounded by parking so you can’t escape that part of the view. Back towards the entrance is the second fridge and coffee maker. Included were three bottles of water. 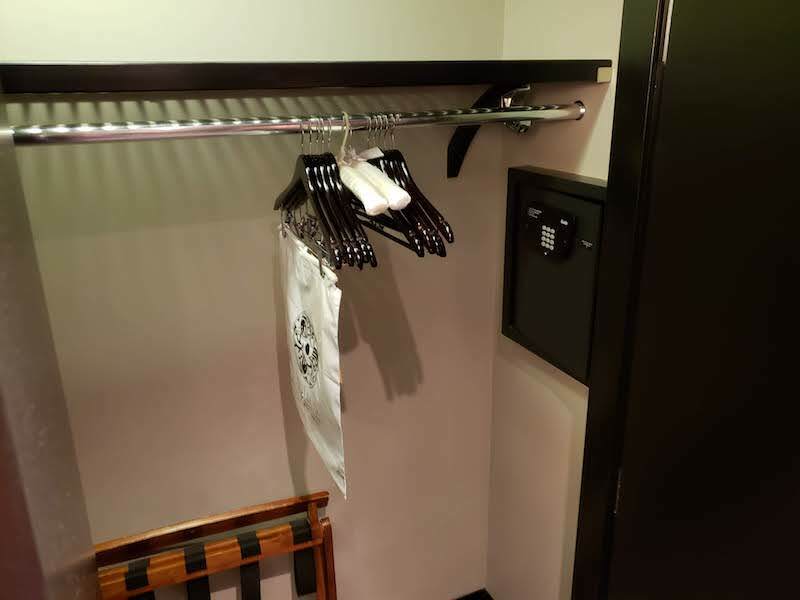 A standard closet is by the entrance. The modern bathroom is separated from the rest of the room by a barn style door that is mostly glass. It reduces privacy for someone showering. 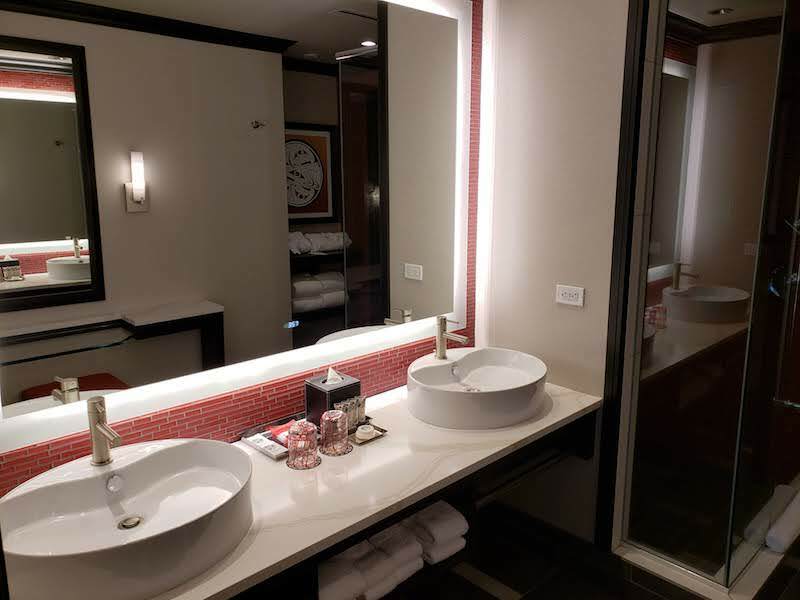 The double vanity with modern shallow sinks and mirror with built in lighting is on one side while a vanity/make up table is opposite. 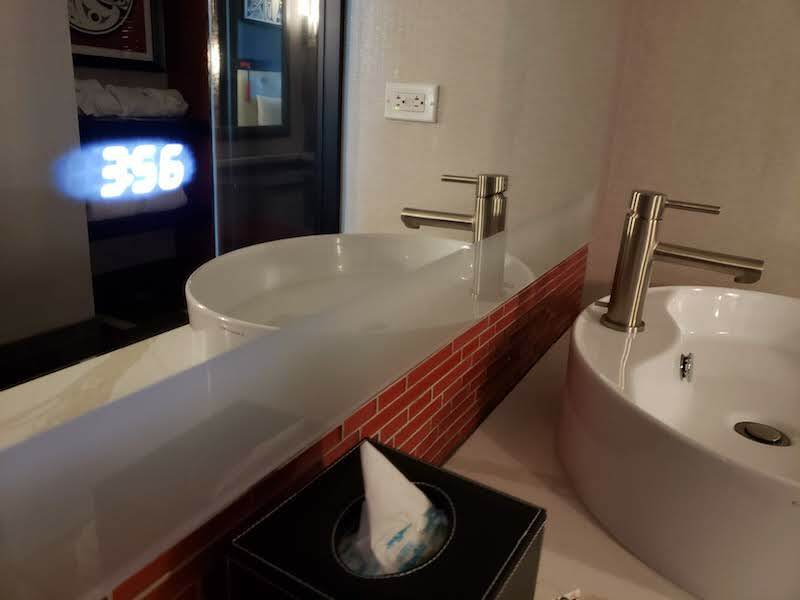 There is no TV built into the mirror but there is a clock (similar to the one in my room at the Hyatt Regency Amsterdam). 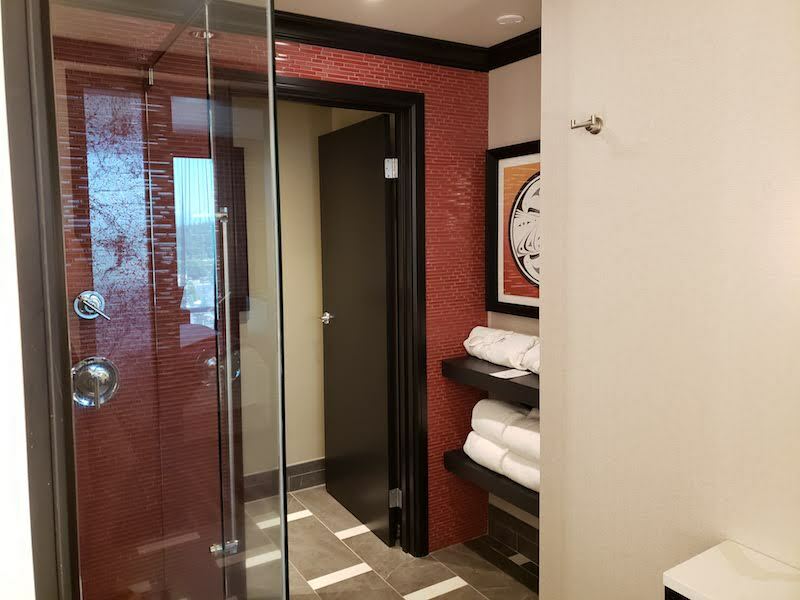 The shower is the best part of the bathroom. While it is not a rain shower, it is a spa like shower with three different shower heads to spray your entire body. 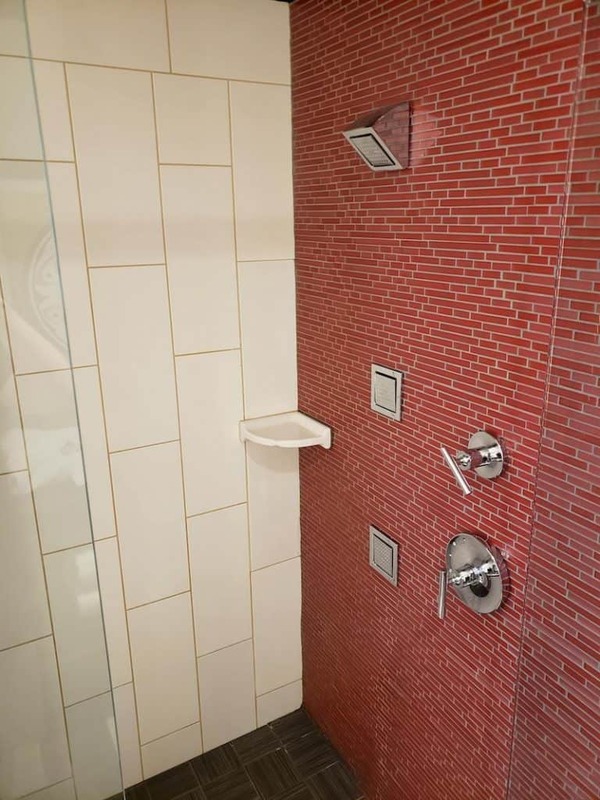 It is adjustable (if you only want the upper shower on you can). 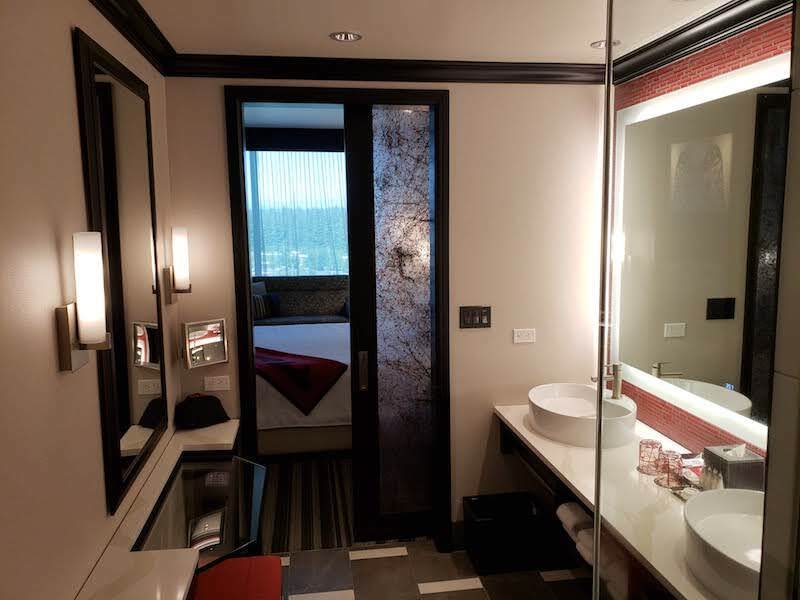 I loved it and it gives the bathroom a luxurious feel even though there is no soaking tub. The toilet is in a lock off nook for additional privacy. 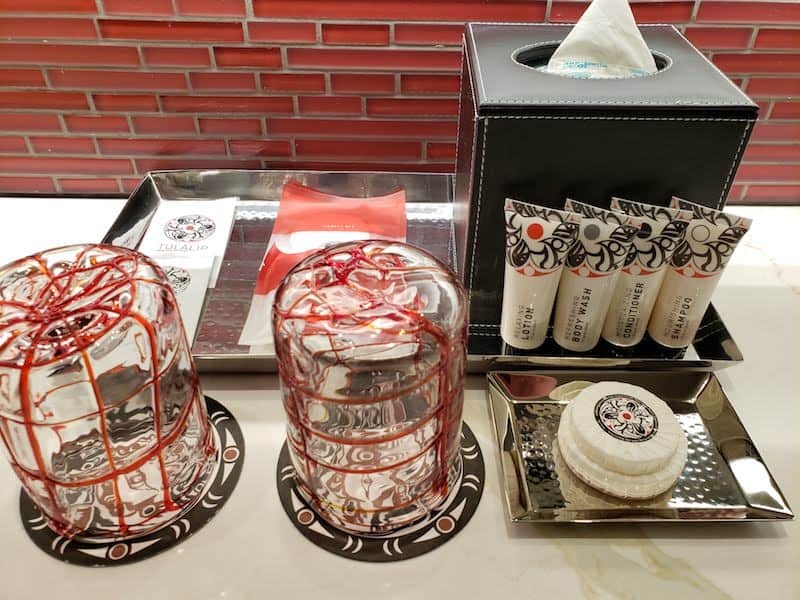 The bath amenities are all Tulalip branded and higher end, “spa” quality. And two bars of soap are included (yeah!). 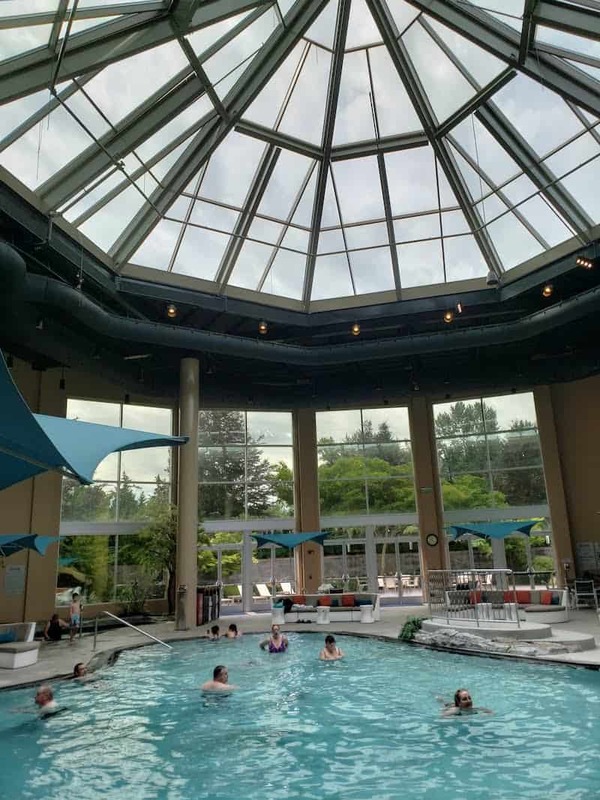 Being in the Pacific Northwest, the pool is located in an indoor atrium off the lobby. It is a nice area, though when I visited, very warm and humid. 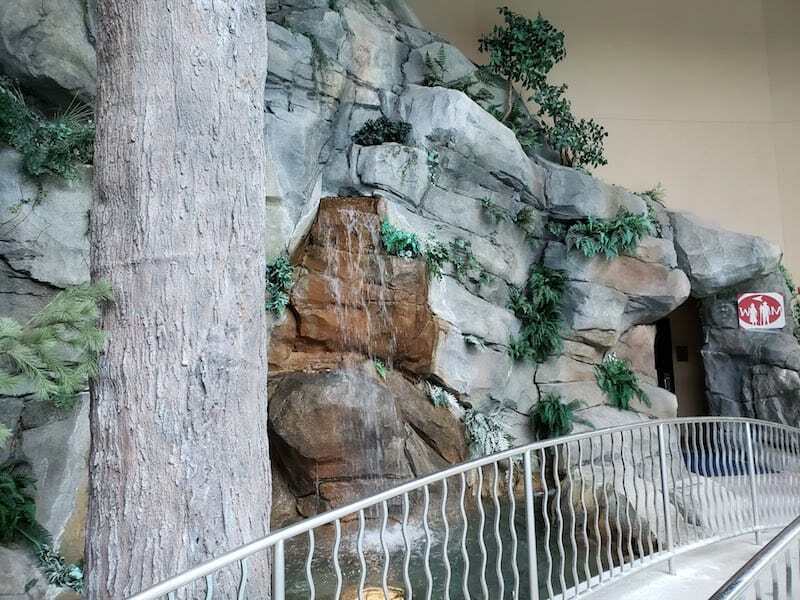 There is a faux waterfall along one wall along with seating area and a hot tub. On the second floor is the spa. Other common areas include a lounge, restaurants, and additional lobby space. 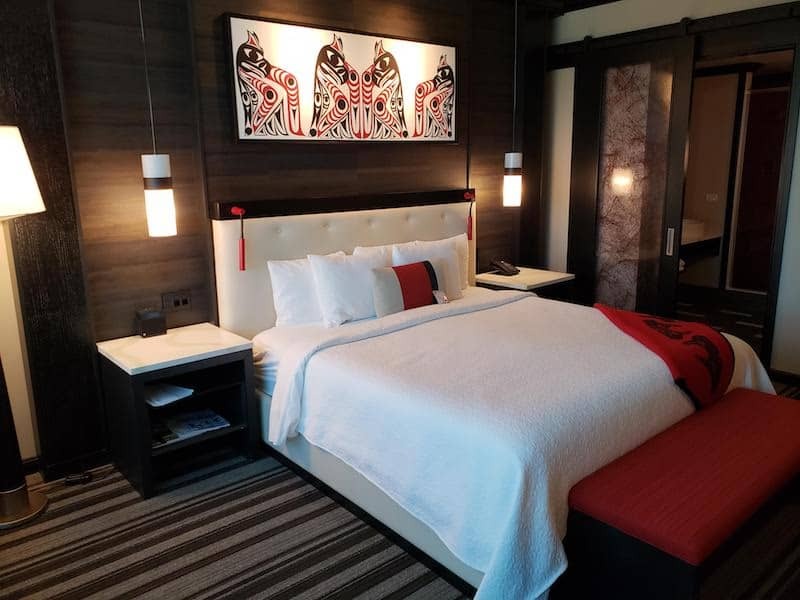 While I went in with low expectations, I was pleasantly surprised by the Tulalip Resort and Casino. 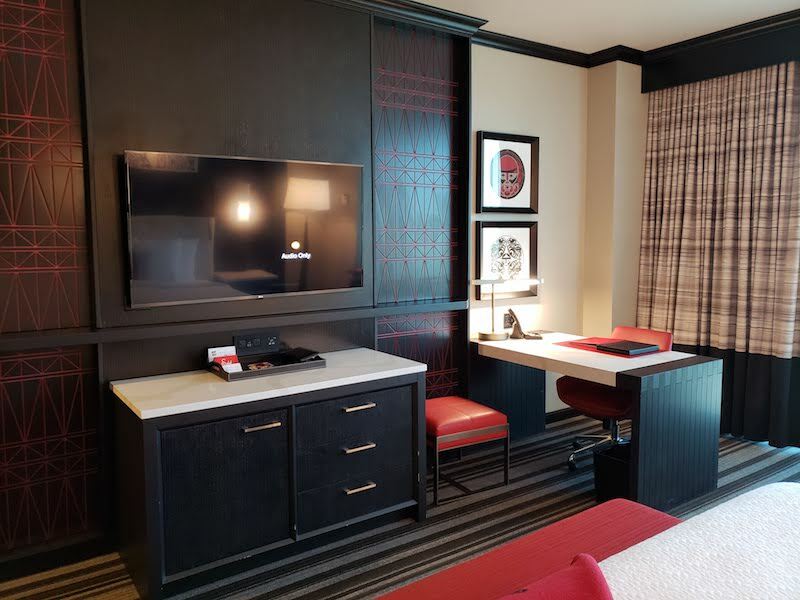 There are no resort fees and the room quality is better than just about any Vegas hotel. 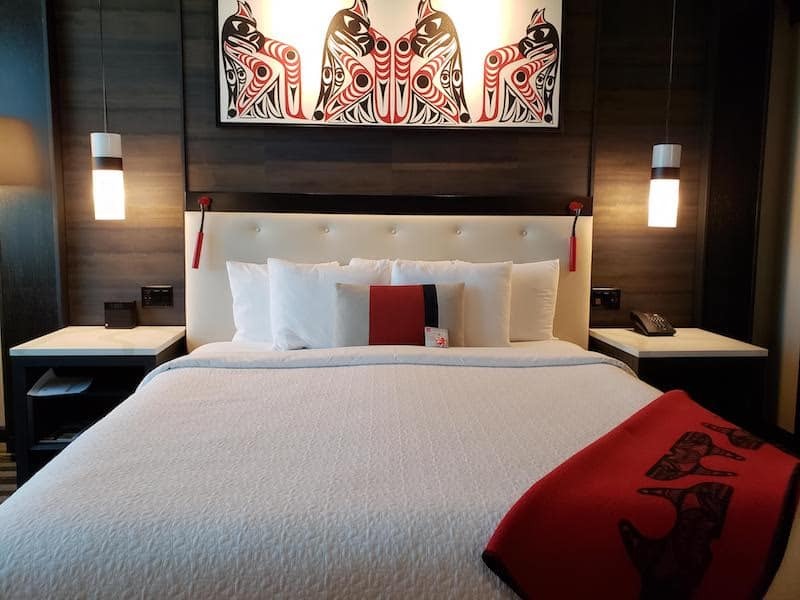 Have you stayed at the Tulalip Resort? What did you think?